The Victorians were the first tourists. The rise of railways afforded these buttoned-down pleasure seekers the chance to see the world. Once the Industrial Revolution took hold and cities started to thrive, people wanted to take cure in the country. As travelers, the Victorians became obsessed with authenticity. Women in basket skirts and men in waistcoats hiked for miles through the countryside in pursuit of stunning vistas. Nature became the symbol of authenticity, and trekking, safaris and the call of the wild became a form of leisure and entertainment. In other words, the Victorian vacation was a pursuit of authenticity in an age of artifice. In the 21st century, our philosophy about travel is similar to the Victorian age. However, the globe has been explored now and exotic destinations are a thing of the past. Where do we go and what do we do to capture that authentic experience? The travel industry has been splintered into many subdivisions. From adventure and extreme sport holidays to spiritual and health retreats, there is no shortage of personalized vacations that attempt to fulfill an authentic experience. These examples barely scrape the surface when it comes to the subversive holidays that are available to the modern traveler. Today, there are more novelty destinations than ever before. If you are a crime enthusiast, you can stay at the Lizzie Borden bed and breakfast in Fall River, Massachusetts. If you want to undergo cheap cosmetic surgery, you can book a Scalpel Safari in Africa. However, there is one significant difference between the new millennium and the Victorian age when it comes to travel. Today, if we cannot find an experience that suits our needs, we will build one. Technology enables us to create authentic experiences, and there is nothing that illustrates this more than the advent of underwater hotels. 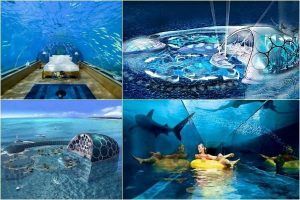 Here is a look at the coolest double beds and complimentary breakfasts 20,000 leagues under the sea. 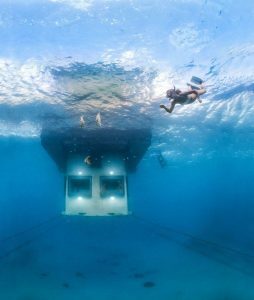 Operating since 1986, the Jules Undersea Lodge is considered the first underwater hotel. Once a research laboratory in Puerto Rico, the Jules Undersea Lodge is currently used as a private, two-bedroom hotel off of Key Largo, Florida. Each bedroom comes with a living room, TV, and DVD player, and the 42-inch portholes give you an excellent view of the parrotfish swimming seven meters below sea level. The Jules Undersea Lodge is more of a rustic, Antarctic outpost than a luxury resort. Guests are required to be certified in scuba diving. The rooms cost $475 dollars a night. At the Utter Inn in Vasteras, Sweden you will find a hotel that is more akin to a traditional fishing shack than a 5-star Hilton. In fact, a glorified fishing shack is probably the best description for this small, single room hotel that is 3m below Lake Malarem. There is a kitchen and bathroom. Both are powered with solar panels. 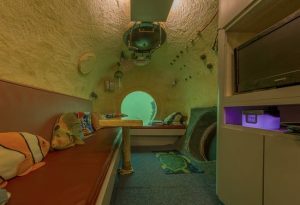 With no flat screen TV or DVD player, the only thing to do is watch the undersea life drift by your window. The proprietor, an artist named Mikael Genberg, may or may not cook you dinner. However, he does leave a canoe tied to the hotel?s wooden terrace, just in case you desire a midnight paddle. 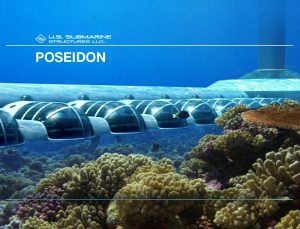 The Poseidon Undersea Resort in Fiji is located on a 5,000 acre lagoon and it?s the kind of sciencefiction construction that once adorned the cover of pulp magazines. If a couple is willing to shell out a $30,000 per week, you also get transportation to and from the airport. The Poseidon has 24 suites that are 12m below sea level, all accessible by elevator. By using a tunnel or submarine, you can access the hotel?s restaurant, spa and bar. 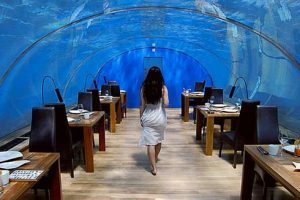 The Hilton Maldives Resort and Spa is not an undersea hotel, but it features an underwater restaurant. Complete with domed glass, 180-degree sea views and a five million dollar price tag, guests access this restaurant down a spiral staircase. 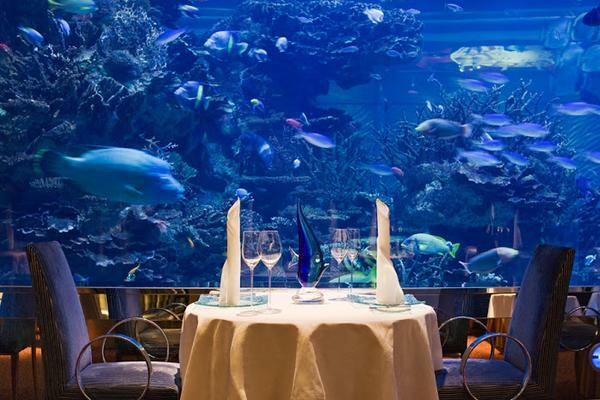 Rates at the hotel start at $510, but there is a $20,000 Petrus on the restaurant’s wine list. Since 2005, the Hydropolis Cresecent Group planned to open extravagant undersea resorts in both Dubai and China. Ground has not been broken yet, with both remaining nothing more than a gleam in a dreamer’s eye. The hotels are planned to be 70 m below sea level and to cost around $600 night.